Not too sure which helmet is right for you? Check out this buying guide to help you choose! One of the most essential pieces of equipment when welding is a welding helmet. The welding helmet plays multiple health and safety roles during the welding process. The correct helmet should provide complete protection, from flying materials to the blinding lights. The purpose of this welding helmet buying guide is to ensure you not only select the correct helmet for your welding applications but for the safety of the welder themselves. A passive lens helmet has a fixed shade, the helmet is worn in the up position while the electrode, gun or torch is positioned. With a quick nod or snap of the neck the operator can flip the helmet into position before striking the arc. For the operator who doesn’t weld often they can find it difficult to position and hold the electrode while snapping the helmet into place. 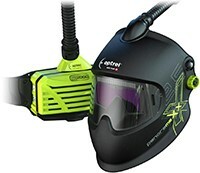 Auto darkening helmets allow for wearing during the positioning of the electrode, gun or torch. This is due to the range of shade lowering usually down to shade 3 or 4, allowing for positioning of the welding equipment, whilst the helmet is in place. When the sensors detect the arc, the lens darkens. This can potentially improve weld quality as there is no movement required before welding can commence. On fixed shade auto darkening helmets, when an arc is detected the helmet will automatically change to the shade opted for on the control dial of the helmet, this doesn’t mean it’s the correct one for the application. 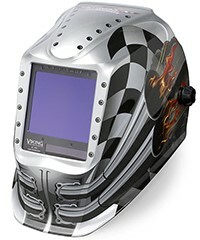 If you tend to weld the same application with the same number of amps, this could be the helmet for you. However, if you are continually changing between jobs a variable shade helmet maybe the ideal solution. 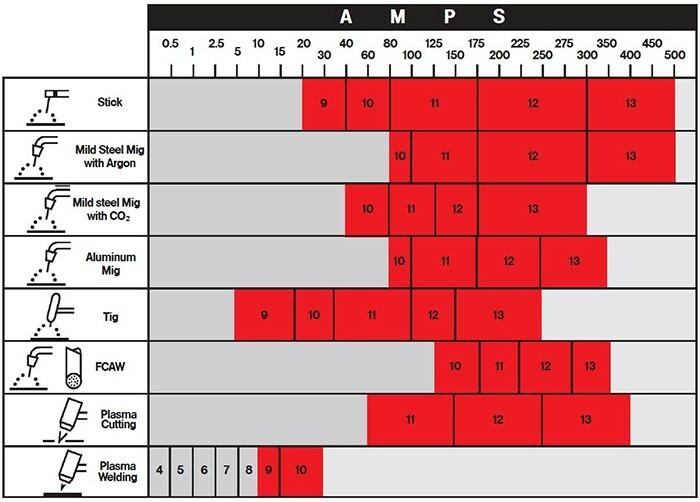 Commonly welders do not change the shade for different amps or applications nor do they know exactly what shade they should be on (see table below for correct shades). If you don’t know the right shade for your application, then let the helmet choose for you, choose a model of helmet which can detect and automatically select the correct shade level. This is a new Optrel feature which can be found on their E684 and Panoramaxx helmets, this is also known as autopilot lens detection. When switching from setting up your weld to the actual welding consider the lens reaction time, in most cases the quicker the better. The more arc’s you strike in a day the more you’ll appreciate a quicker speed. Some helmets have an adjustable display control, this allows for the lens to stay darker for a period once the arc has stopped, this would be beneficial when welding at high amperages, as molten metal may still emit harmful rays while it cools. The optical clarity defines the quality of view you get through the helmet, you wouldn’t buy a cheap pair of sunglasses, so don’t let the quality slip when it comes to welding, after all you only get one set of eyes! Optical clarity is governed by European Standards for the welding industry, the standard is known as EN379. Ratings are determined by tests that measure light transmission across the cartridge as well as lights from the cartridge layers. The ratings are displayed as numbers, each defining an aspect: Optical class (distortion), diffusion of light (blurry image), variations on luminous transmittance (even shade) and angle dependence. Ratings are graded on a scale of 1 to 3 in each class. A score of 1 is perfect, while 3 is the worst rating. So, the perfect clarity score is 1/1/1/1. The bigger the better right? Not necessarily in this case! Consider your environment when selecting the viewing size of your helmet. The bigger the viewing size, the bigger the helmet and possibly the heavier the helmet. Helmets usually range from 2 sensors to 4. The more sensors the better coverage, if you are welding in restricted areas sensors could be obstructed, therefore the more the better. Comfort — Ensure the helmet has a good fit or has changeable head gear. When wearing the helmet for longer periods, ensure weight is kept to a minimum. Powered Air Purifying Respirator (PAPR) – Do you require a fresh air unit on your helmet or may require one in the future? Check out the availability of an upgrade to a fresh air unit. PAPR are air fed helmets which supply filtered air back into the helmet to ensure the welder does not breathe in welding fumes. If we’ve given you too much to think about, don’t hesitate to contact our sales team who will be able to assist in selecting the correct welding helmet for you, sales@rapidwelding.com or on +44 (0)23 92 214 214. Now for the fun bit . . .
Now you’ve got an idea of the requirements for your desired helmet, let’s review some possibilities. If you’ve decided you require the Elvis Presley (King) of the welding helmet range, look no further than the Optrel Panoramaxx auto darkening helmet with a E3000 PAPR system everything you could possibly require in a helmet. Maybe you want something close but not quite top of the range with a more reasonable price tag, the Weldline Goldenark the David Bowie of the welding helmet range, the general all-rounder with a bit of attitude, something a little more fashionable. 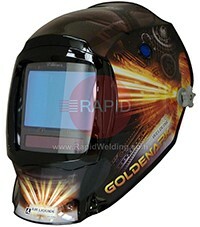 The GOLDENARK is a high technology welding helmet for any application and gives the ultimate welder protection. Neither of those interest you? meet the Jimi Hendrix, great all-rounder with the ability of being the most influential. 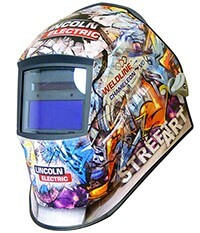 The Lincoln Viking 3350 Motorhead is Lincoln's top of the line welding helmet series, providing the very best in optical clarity and the largest viewing area in its class. Fancy something with a bit more energy, invigorating and inspiring? Check out this limited addition Lincoln Electric Weldline Street art Chameleon, with only 64 available in the UK you're guaranteed to inspire your colleagues, Paul McCartney style. This helmet has a solar cell for power and a replaceable AAA battery, this is unusual in a helmet at this price point. Still not too sure? Shop the full range of helmets available from Rapid here. Try before you buy and see the difference in helmets at our facilities in Portchester, Portsmouth. We have these helmets and many more on display for you to try before you buy. Alternatively, if we’ve given you too much to think about or would like some more options to suit your needs please contact our sales team, sales@rapidwelding.com or on +44 (0)23 92 214 214.